Best Halloween mix you’re likely to see all season…courtesy of Grey Haas. 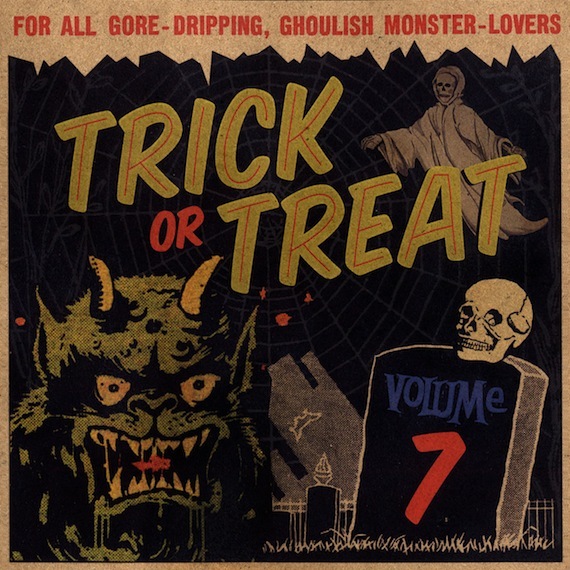 Save a couple tracks the collection is comprised of 25 vintage spookers spanning 1958-1966. Tracklisting/download after the jump. Boo. Volumes five and six are still available here and here. outstandingly creepy.thanks.any chance of a repost of 1 to 5 ? Love these mix tapes. Link is dead though…. @Tob – just checked the link. it’s alive and well. Strange i get a 404 error. must be just me. Grrrr I want this badly. Thank you so much for sharing these. Happy Halloween. Thank you for this. I would love to hear volumes 1-4 as well! Where the hell can I get some more Daringers? Love it…Especially the homely, slight scratchy sound of vinyl makes it even more authentic…Perfect! Pingback: Stumbling Over Chaos :: Halloweenity Linkity Booity, plus GRL Swag Giveaway! Loving the mixes! Would love a re-post of volumes 1-4. I can’t help misreading the text at the top of the sleeve as “For Al Gore – Dripping, Ghoulish Monster Lovers”. awesometown. thanks for the work of finding and putting these together. Ohpleaseohplease repost the first 4 volumes?? Ohplease! If I can’t have your Blog Radio Halloween Special in my personal collection alongside the Purple Knif Show, then I’ll take as many of these as possible. Where are volumes 1-4 again?? Thank you so much for posting these. Awesome collection of spooky tunes! !